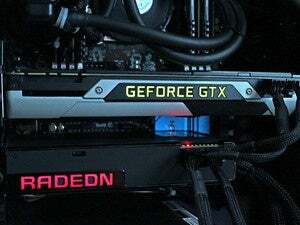 Packing a socketed desktop Intel CPU and a full desktop GTX 980, it's hard to imagine this beast on a lap. Rather than "desktop-like" performance in your laptop, Origin PC's burly laptop gives you actual desktop performance. Seventeen inches wide. More than 10 pounds of heft. A socketed Core i7 Skylake CPU and a desktop GTX 980 card crammed inside. More graphics horsepower than any laptop we’ve ever tested. 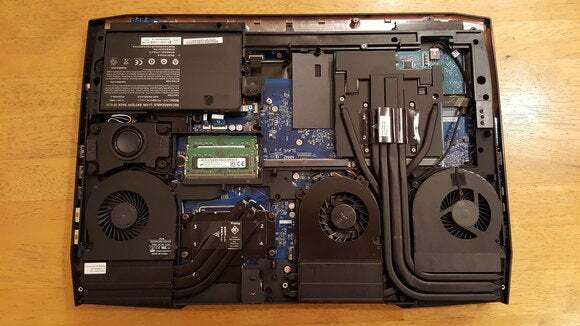 When does a laptop cease to be a laptop? Origin’s EON17-SLX might be the answer. Origin has never shied away from sacrificing portability on the altar of power. I should know—I hauled an Origin laptop around for about a year and a half until I traded it for something a bit more back-friendly. The EON17-SLX carries on Origin’s proud tradition of making weightlifting/laptop hybrids with a 16.8 x 12 x 1.8-inch chassis, and a (literally) staggering 10.5-pounds of weight. And that’s not counting the power brick cinderblock, which adds another three pounds to the total. I’m typing this review on a dainty 970M-equipped MSI laptop—you could fit two of these inside the EON17-SLX, with room to spare. The result is a laptop in name only. You could tote the EON17-SLX around. You could use the EON17-SLX on your lap. But woe unto those who try. This is a machine meant for sitting on a desk. It might as well have a “Move only in case of emergencies” sticker on the outside. That being said, it’s perfectly inoffensive once you find a home for it. Bland, if you’re feeling less charitable. Design has never been Origin’s claim to fame and the company has yet again made a laptop that’s more serviceable than stunning. 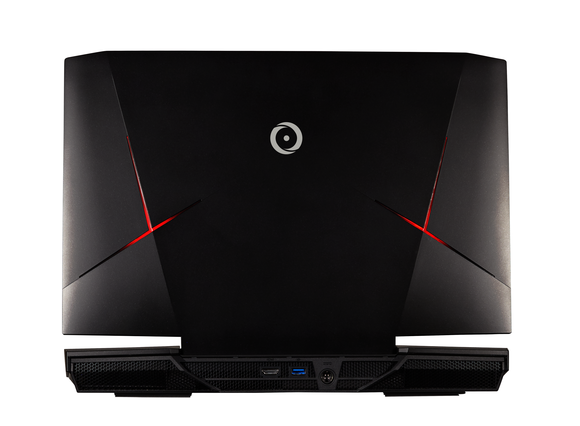 Origin has clearly taken some cues from Alienware, embedding two angular, color-changing LEDs in the lid. But other than that, it’s a pretty generic-looking chassis. A chunky rectangle. A black box. Even if you spring for colored metal (an extra $225) or a custom paintjob (an extra $299), the EON17-SLX lacks the immediately identifiable cues of something like the Razer Blade or Alienware 17—which is a shame, given how much Origin’s machines cost. I’d expect an above-average design. And I hoped for a bit more inside, too. The IPS display is G-Sync equipped, but its 1920x1080 resolution is a bit surprising given that’s now the baseline for gaming laptops. I would’ve expected at least the option to go up to 1440p, if not 4K. The same goes for its 75Hz refresh rate—perfectly fine, but not impressive. Still, color reproduction and contrast are on or slightly above average, even with the screen’s matte finish, and I didn’t detect any major issues. It’s just a shame that Origin didn’t include a screen that matches the rig’s performance-oriented components. Down from the screen, tucked into the upper right and left corners, are two top-mounted and extremely loud speakers. They’re heavy on the treble (especially as you increase the volume) so I wouldn’t necessarily recommend serious gaming on them, but in a pinch they will fill a room—and then some. Even at 50 percent, the EON17-SLX was about as loud as I keep the speakers for my desktop system. You have plenty of options for speakers, though. Four ports on the left side allow you to use anything from a standard analog headphone or microphone to a full 7.1 setup if you’d like. Also on the left are three USB 3.0 ports and two gigabit ethernet inputs. The right side plays host to another USB 3.0 port, a USB-C Thunderbolt port, two DisplayPort outputs, and an SD card reader. And on the back reside the power port, another USB 3.0 port, and HDMI-out. Phew. Rounding out the design are a noteworthy keyboard and a respectable touchpad. The keyboard is a high point, with slightly more travel than is found on other laptops. While it’s a bit less crisp than your average scissor switch board, the extra room to maneuver meant my wrists/fingers felt less fatigued after long bouts of typing. My only issue is that there’s an abnormal amount of space between the keys, due to some beveling. The touchpad, on the other hand, could use more physical definition to make its presence more obvious. It’s fairly large but built to blend right into the rest of the laptop, which can be awkward at night. I also needed to crank up the sensitivity a few notches, but that was an easy fix. It’s not all bad, though: Physical mouse buttons are always a plus in my book, and the fingerprint sensor in the middle is easy to ignore if (like me) you don’t care about that feature. But who cares about the design? We’re here because Origin promised desktop-level performance in a portable machine, and hot damn did it deliver. To recap, the EON17-SLX contains both a desktop CPU and a desktop-performance GPU—an Intel Core i7-6700K and a GTX 980 in our model, to be exact. What’s more, the Core i7-6700K we tested came overclocked at a zippy and stable 4.5GHz. Absolutely remarkable. Our model also boasted 16GB of DDR4/2133 RAM (though you can opt for up to 64GB if you’re crazy) and two drives—a 256GB Samsung 950 Pro PCIe m.2 drive and a 1TB 5,400rpm HDD. If you want to splurge you can opt for two m.2 drives and two 2TB Samsung 850 Pro SSDs (with the latter costing almost $1,000 a pop). It’s a hell of a lot of fancy hardware, with our model coming in just north of $3,000. Which—you’re right—is an insane amount of money to pay for a laptop. But who am I to judge? Performance is suitably incredible regardless, chewing through our benchmark suite and putting other laptops to shame. In PCMark 8, for instance, the EON17-SLX put up a Work Conventional score of 4,320. That handily beats out MSI’s GT72S Dragon, which also featured a GeForce GTX 980 part (though a Core i7-6700HQ mobile processor). We also ran our standard Handbrake encode test, taking a 30GB MKV file and running it through Handbrake’s Android Tablet preset. With Origin’s 4.5GHz overclock, Handbrake finished encoding the file in a record 38 minutes and 22 seconds, or 2,302 seconds total. That score takes a torch to the mobile quad cores we’ve seen running Broadwell and Skylake chips. And when it came to graphics, the EON17-SLX set a blazing score of 6,021 in 3DMark’s FireStrike Extreme test. That handily outstrips the GT72S’s 5,606 score and beats our GTX 980-equipped PCWorld Zero Point desktop. Real-world performance is similarly impressive—112.8 frames per second in Tomb Raider on Ultimate (versus 100.1 for the GT72S) and 100.3 in Shadow of Mordor on Ultra with the 4K texture pack installed (95.4 for the GT72S). The only downside to all of this muscle: heat. A lot of it. Day-to-day web and writing use is fine, but start gaming and you’ll hear the fans spin up. Maybe the speakers are so loud because they need to drown out the jet engine roar of this system under load. It has desktop parts. It has desktop performance. But does it have a desktop’s signature upgradability? Most of the time we’d accept that the answer is “No” and move on, but we were intrigued by the EON17-SLX’s use of a socketed CPU. Provided it was easily accessible, that would technically allow for desktop-esque upgrades. Sure enough, it looks like you can remove the CPU heatsink with four or five screws, with the socket easily accessible underneath. 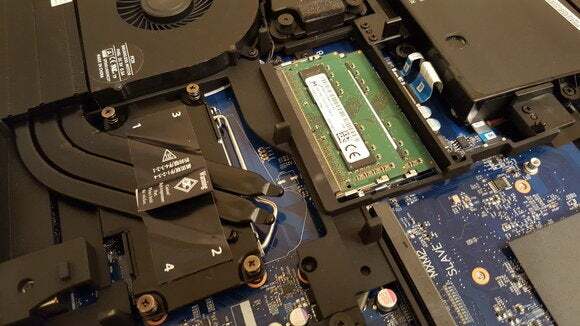 We stopped disassembling here, but as long as Intel’s next processors use the same socket and are compatible with the chipset and BIOS, you could technically upgrade the EON17-SLX’s processor. A closer look. You can see the arm for the CPU socket peaking out from under the heat pipe. Now, would you ever do that? Probably not. The Core i7-6700K is already a top-of-the-line chip, and it’s doubtful you’d see a tangible boost from any upgrade before Intel changes its CPU socket again. But the point is you can upgrade, and oftentimes with a PC, having the option is more important than taking advantage of it. The EON17-SLX is the most desktop-y laptop to ever come through PCWorld. Sure, you can build an actual desktop for cheaper—my colleague Gordon Ung dove into that math when he reviewed MSI’s similarly stacked GT72S. But that shouldn’t take away from Origin’s accomplishments here, especially because the desktop/laptop price disparity isn’t as high as you might think. Maybe you travel a lot, maybe you’re a game developer in need of a mobile demo station, or maybe you’ve just got money to throw around. 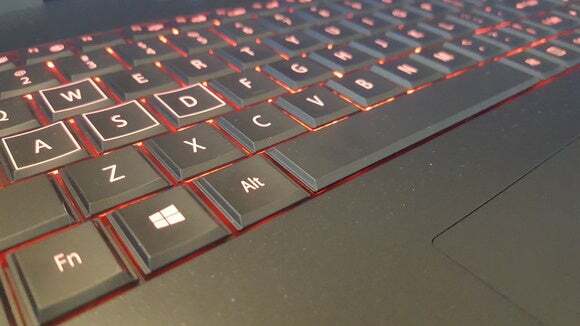 In that case, the EON17-SLX is a damn impressive piece of engineering and well worth a look. Just make sure you’ve been doing back exercises before you pick one up.